In celebration of its 10th anniversary this year, Dewitt has launched it s first steel Academia timepiece. Created in a limited series of just 200 pieces this year, the Academia Steel is a bold, sporty chic self-winding timepiece that offers a new opening price for the brand but still maintains its tip-quality DeWitt Manufacture craftsmanship. Another first for the brand: the watch is offered with a steel bracelet or with a rubber strap. 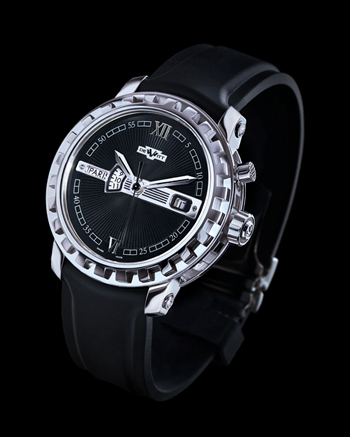 It offers hours, minutes and big date as well as 42 hours of power reserve. The rotor is finished with the Cotes de Genève pattern and the finely finished caliber is visible via a transparent sapphire caseback. Best of all, this watch can now be had for an amazing price of $12,000.